With Russ Grimm's recent induction into the Hall of Fame, the number of Washington Redskins in the Hall from the Joe Gibbs glory years rose to five—Gibbs, John Riggins, Darrell Green, Art Monk and now Grimm. It has long been an article of faith among Redskins fans that the Hall was somehow biased against those teams; that they were under-represented. Theories as to why include that the blue-collar Redskins weren’t “flashy” enough, and that the individual players weren't of self-promoting type who get their names into the news by any means necessary. 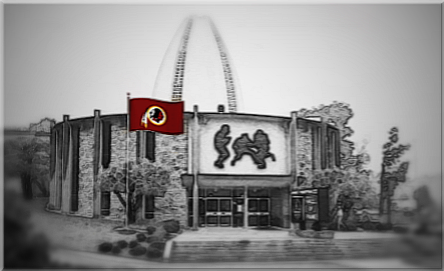 Redskins fans have long believed—I can say this because I count myself among them—that the Glory Years Redskins teams have been under-represented, at least as compared to the teams one automatically thinks of when discussing the Hall of Fame. I thought I might put the theory to the test. Having cut my football fan teeth as a child of the 1970’s, the first team I thought of was the legendary Pittsburgh Steelers—they of four Super Bowl titles in six years (1974-79). There are ten Steelers from that era in the Hall of Fame. Next I thought of the iconic Vince Lombardi Green Bay Packers, the early 1960’s teams that mark and dominated the beginning of the Super Bowl Era. There are also ten Lombardi Packers in the Hall. What about the Don Shula Dolphins of the 1970's? Eight of those big fish are mounted on the walls of Canton. The great San Francisco 49er teams of the 1980’s and early 90’s sent six to the Hall. I almost hated to look, but I did: what about the hated Dallas Cowboys of the 1990's? Four of those cursed silver stars dot the shelves. It turns out the media-darling Chicago Bears of Iron Mike Ditka vintage have inducted four as well, and Bill Parcells’ stout New York Giants teams have sent three (four the day Parcells becomes eligible). Not pretending to offer any great insight here, but it appears the farther removed a team is from its dynasty years, the more players associated with it tend to wind up in the Hall. It is entirely possible, in other words, that a decade or two from now the Gibbs' Redskins will be even better represented in Canton than today. Possible inductees from those teams include Dave Butz, Gary Clark, Joe Jacoby, Charles Mann, Mark Moseley and perhaps even the terminally loquacious Joe Theismann. Note that the site reflects certain players as representative of more than one team (e.g., Reggie White is listed both as an Eagle and Packer; Sam Huff as both a Giant and Redskin) so it is not an exact science. So what does all this tell us? Among other things, it tells us that time is as big a factor in the number of players a franchise has enshrined in Canton as their subjective level of sexiness or self-promoting brashness. And that the election process, necessarily run by flawed human beings, has probably not been as unkind to the Washington Redskins as many among their passionate fan base believe. If you are one of them, take heart. In addition to the Gibbs Era Redskins noted above, lifetime Redskins like Chris Hanburger (nominated for the Class of 2011), Pat Fischer, Larry Brown and others may well end up clad in yellow blazers delivering heartfelt speeches as well. Meanwhile—because the formal induction process is flawed, and to indulge in the right fans have to impose their own biases on the process—for your consideration and appraisal, here is one passionate Redskins fan’s all-time teams that either is or should be in the Hall of Fame. I would match this team against any you might care to assemble. This is great blog for any NFL football fan and has a lot of helpful information about the Redskins. Keep up the great work! I bookmarked this blog to check back regularly!